Whether it's swashbuckling on the high seas, investigating a murder on Mars, or attending the court of King Arthur, the ParaSpace Role Playing System is a generic set of rules that can be used to play games set in a multitude of settings and styles. Inside you will find a comprehensive role playing game system allowing for balanced character creation at various levels of power and experience. Combat mechanics that can be played as gritty and realistic or, by adding in various skills, abilities, techniques and manoeuvres, can become heroic high fantasy. The magic system has also been developed to fit in with varying genres and settings and encompasses inherent magic, rituals and ceremonies, traditional spell slinging, the creation of potions and other magical items, free-form magic and special abilities. In the Game Master section you will find templates that enable the quick creation of a multitude of creatures and Non Player Characters as well as hints on running games, building settings and designing adventures. 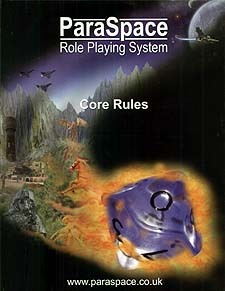 In short, the ParaSpace Role Playing System is a complete set of generic rules that contains everything game masters and players need to open the door to the many worlds of their imagination. Core system that uses one ten sided dice plus modifiers to determine success or failure. Players may change dice results by utilising the Luck attribute. Characters may specialise with weapons and focus upon specific elements such as hit, parry, damage or speed. Injuries are tracked by damage points and wound brackets that define a level of impairment. Extensive equipemnt lists that cover medieval to futuristic technology. Eight styles of magic; incorporating rituals, traditional fantasy spells, potions, poultices, enchantments, sigils, special abilities and a free-form style that enables spontaneous magical effects. Over 300, fully detailed, magical/spell effects. NPC templates at various levels of power and creature size allow the GM to quickly ad-lib any creature or warrior as required. Random adventure and plot generator.